The story of Aladdin and his magical lamp is an enduring tale. It became famous through the Book of One Thousand and One Nights, an old Arabic book of fairy tales, and later through Disney's cartoon movie version of the story. Aladdin finds a magic lamp with a Genie inside--a powerful being able to grant Aladdin wishes. 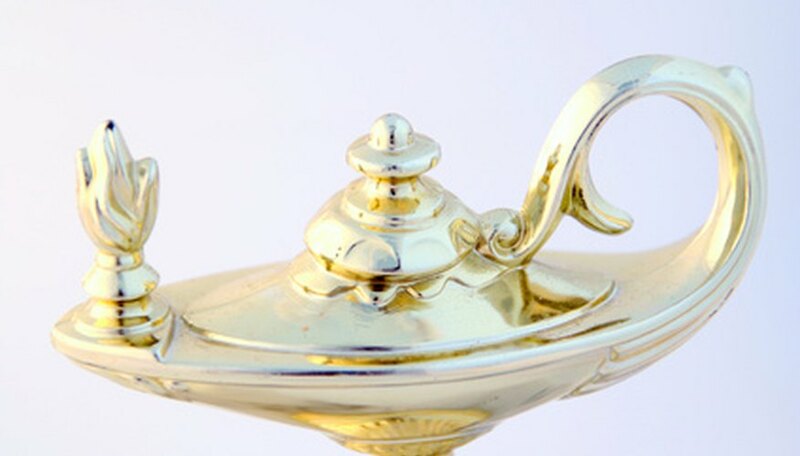 While the lamp depicted in the story is typical of Arab oil lamps, the style has since become known as the ‘Genie lamp’ in deference to the Aladdin story. If you know the steps, this type of lamp is easy to draw. Sketch an oval very lightly on the page. Sketch a long, thin triangle on one end of the oval, with the base of the triangle attached to the oval. This is the basic shape of the lamp. Sketch a circle, about one-quarter of the size of the oval, attached to the oval on the opposite end as the triangle. Sketch a second circle within that circle to give the basic outline of the handle. Sketch two semicircles with slightly concave bottoms, one on the bottom of the oval for the base of the lamp, and one on the top of the oval for the lid of the lamp. Draw a small half-oval on the top of the lid, then draw in the outline of the lid in harder pencil. Elongate the tip of the triangle, bringing it slightly upwards to give the shape of the lamp mouth. Draw a small oval in the end, shading it in, for the hole in the lamp mouth. Draw around the outline of the combined oval and triangle, erasing the sketch lines where they meet to give the lamp one continuous body. Draw in the outline of the base, erasing the line where the body of the lamp slightly cuts into the top of the semicircle. Draw in the circles for the handle, erasing the lines where the circle crosses over the body of the lamp. Erase any remaining sketch lines, leaving the drawn-in outline of the genie lamp. Look at different pictures of genie lamps for ideas about varying styles of handles, lids and bases, as well as decorations.